Chris has had extensive soccer experience, as a player, coach, and leading soccer programs both in the United States and England. Mr. Allen has worked with several organizations in Michigan after arriving in the States following an impressive playing career at youth and senior levels. He has spent over ten years working as a Head Coach at Davenport University, an NCAA Division II Women’s Soccer program. Chris worked with the Michigan State Youth Soccer Association as a member of their Olympic Development Staff, and has participated in many educational opportunities with the United States Soccer Federation and the United Soccer Coaches organizations. He earned a Master of Business Administration in Strategic Management, in addition to other degrees and diplomas, which bolster his leadership abilities and innovation. 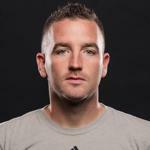 He currently holds multiple coaching licenses and diplomas, including the NSCAA Director of Coaching Diploma. Over the years Chris has played a large role in starting programs, leading them successfully, and staying to help them flourish through challenges. He has also had the privilege of coaching a plethora of players who have entered into the men’s and women’s professional ranks overseas and in the USA, NCAA Division 1, 2 & 3 colleges and universities, and State and Regional ODP teams.